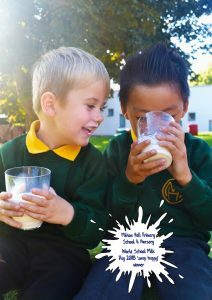 In September, we invited over 10,000 schools across the UK to get ‘snap happy’ to celebrate World School Milk Day by taking creative photographs of their pupils enjoying their nourishing 189ml daily milk entitlement. We’ve been overwhelmed by both the positive response and the colourful images we’ve received. We’d like to say a huge “thank you” to everyone who sent in pictures of their pupils enjoying their mid-morning milk, which leading experts say is important to underpin physical and mental development. Out of the unprecedented number of entries received, we’re pleased to announce that the winner is...Milton Hall Primary School & Nursery. Congratulations! The lucky school will receive a prize of £250 to boost their budget and a bespoke canvas print of their competition entry. You can see the winning photograph below – we hope you enjoy it as much as the children are enjoying their milk! You can see a selection of our entries from schools across the UK in the gallery here. Simply click on a thumbnail to expand the image.